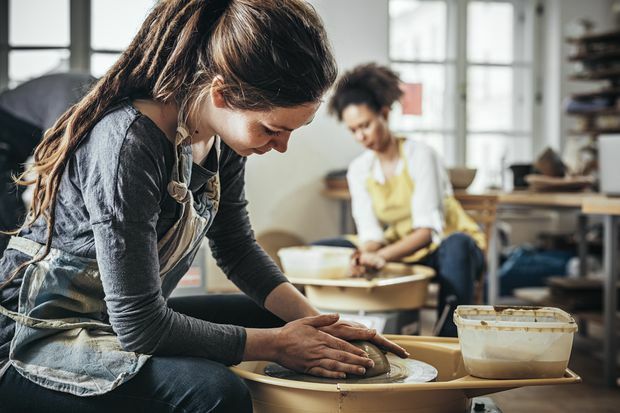 People are turning to traditional hobbies such as pottery to relax and reduce their screen time. On a gloomy Wednesday last month in Toronto, a group of writers and editors were invited to a “wellness morning,” where we partook in a guided meditation before leaning into the hottest new craze: knitting. We were taught to make chunky, earth-tone snoods by a pair of wispy-haired Spaniards while snacking on homemade granola. The event was run by We Are Knitters, a Madrid-based company that is modernizing the hobby through its DIY knitting kits featuring Peruvian wool and eco-friendly packaging. Its kits are sold at a variety of ultratrendy boutiques around the world and the brand has just expanded into Canada. “There’s something about the weather and the coziness that seemed perfect for knitting here,” co-founder Alberto Bravo says. Sure, the weather has something to do with the desire for a couch-friendly activity, but knitting’s resurgence is part of a larger move towards digital detoxing as the negative effects of screen time become more widely examined. A recent study conducted by the British-based charity Knit for Peace claimed the activity is as relaxing as yoga, with the ability to distract from chronic pain and lower blood pressure in its 15,000 volunteers. Pair this with the newfound popularity of pastimes such as quilting and skating (the latter of which is so blissfully illustrated by Queer Eye’s Jonathan Van Ness recent proclivity for performing amateur skating routines to the tunes of Destiny’s Child and Cher on Instagram), and hobbies could prove to be self-care’s new frontier. Toronto-based art therapist Or Har-Gil says social media is a frequent concern for patients. “It’s so pervasive that whatever other problems people have, that’s something that’s running in the background,” she says. A 2016 study published by the U.S. National Institutes of Health cited the reduction of cortisol levels with just 20 minutes of art making and physical activity. “When you’re doing a lot with your body, it helps you connect to your body and other parts of our brain – our subconscious and our emotional side, and not just immediate racing thoughts,” she says. Har-Gil uses everything from clay to watercolour in her workshops, which she says attributes to a “free-flow” state rarely accessible today. “Your brain can be processing things in the background, which is so important for problem solving and we don’t have that in our day to day lives,” she says. Similarly, Iwona Aldomar originally started experimenting with pottery as a means of quelling anxieties that come along with frequently using social media, specifically Instagram. “The best thing about doing pottery is getting your hands dirty so that you can’t touch your phone while you’re doing it,” she says. “It’s a meditative experience in that you’re creating something from literal mud, which is the most satisfying thing in the world.” Aldomar’s ceramics, which she makes under the name Odd Pot, are anthropomorphic fruits and vegetables wearing quirky facial expressions.